In Thailand, traditional rice wine is called Sato. Its very simple to make, has a relatively high alcohol content, and tastes great – what more could you want? The only difficulty in the process is obtaining the yeast balls to make it. 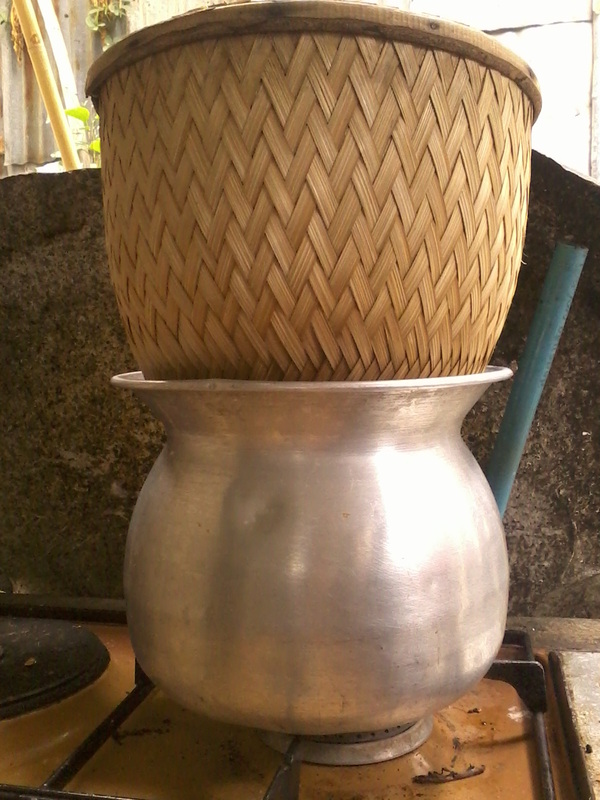 These exist as two kinds – one for making Khao Mak (a fermented rice desert), and one for making Sato. They are not the same! Thai’s will tell you that you cannot make Sato from a Khao Mak yeast – well you can, but the taste will be different. There is an extremely long thread on the homebrewtalk site where people have been posting the results of the rice wine using the Sato method, and also adding red yeast rice (RYR), traditionally used in chinese-style rice wine. From what I can gather, most people are using yeast balls for Khao Mak, i.e. 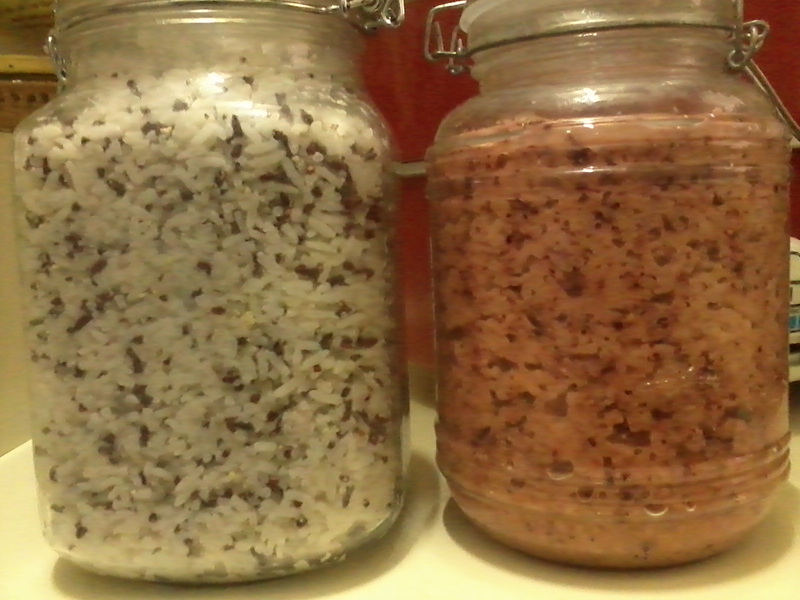 fermented rice desert yeast. These are readily available at Asian markets in packets. When you use these yeast balls, the resulting Sato will be sweeter, and take longer to brew. Sato made with Sato yeast balls is less sweet, has a burn on the throat when you drink it, and takes no more than one week to brew. But obtaining the yeast balls is quite difficult, as its not particularly legal! There are a few sanctioned makers of the yeast (which I was unable to find), but generally in country town markets, someone would be able to point you towards the local yeast maker. What is actually in the yeast ball, I could not find out – or the differences between the ingredients in the Sato and Khao Mak yeast balls. Thai Sato is also only made with steamed sticky rice. This rice will hold its shape much better, resulting in less breakdown of the grains – which causes the wine to become cloudy and thick. A long brewing time and rice breakdown will result in a sour taste. Another point is that traditionally it is only made in winter time. This slows the fermentation slightly, giving more time for flavour to develop. Too short fermentation time will produce an alcohol burn and little taste. Water is also important. If you have access to good spring water, use it! Otherwise, adding mineral water at the last stage will also help in adding depth of flavour to the wine. So here are the instructions to make Sato which I recieved from an Isaan friend – experts in rice wine making and drinking! 1. 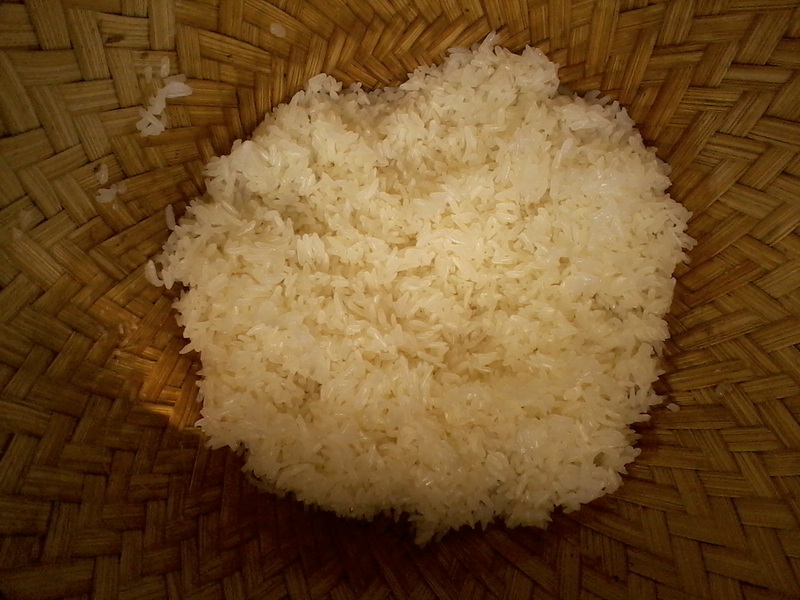 Wash a kilo of sticky rice (or sweet rice as it is sometimes packaged) until the water runs clear. Soak it for a couple of hours. If you don’t soak it, the inside of the grains will not cook evenly and you will either end up with undercooking or overcooking the rice. 2. Rinse it again until clear, and put in a steamer and steam for up to 20 minutes – until the grains are still firm but are clear in colour. 3. This step is optional: put a couple of tablespoons of food grade hydrated lime (also known as cal, and used in central America to nixtamalise corn) in a basin with water. Mix and leave to settle. Pour off the clear water into another basin, leaving the dregs behind, which you can discard. Put your cooked rice into a muslin cloth and tie it, then submerge it in the lime water for up to 5 minutes. Take out and let the excess water drain off. This process is to ensure the grains keep their shape during fermentation and don’t break down so easily. When you make Khao Mak, you need to do this step so each individual grain is separated and whole. For Sato, it is not important. 4. 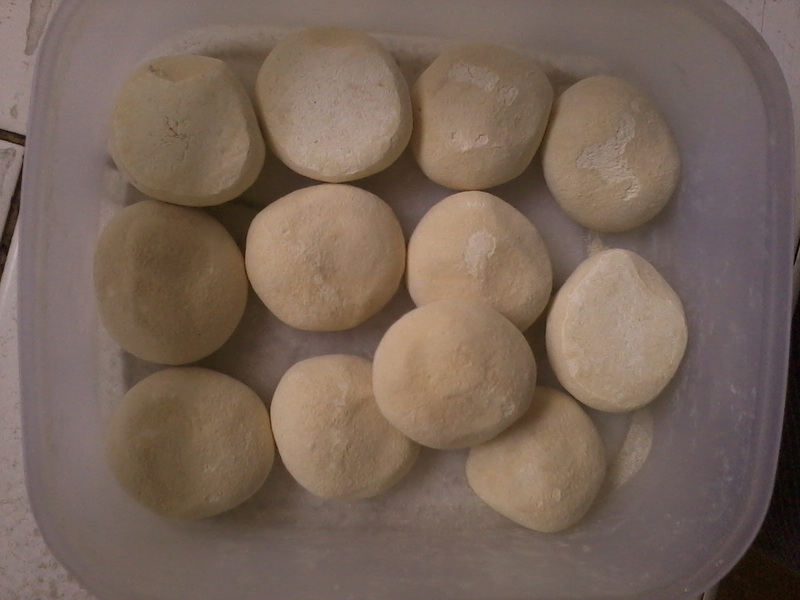 Crush 2 rice yeast balls (per one kilo of rice). Massage it into the cooled rice. Put into a jar with a cloth cover to allow gas to escape. 5. Keep for one week. On the last day (day 6/7), add about 500ml of mineral water and a few tablespoons of sugar (dissolve in water). Leave for another 12 hours or until the rice is floating. Strain off the lees, and bottle. For this last stage, you could experiment with honey, sugar cane juice etc. My Isaan friend usually adds a bottle of Spy wine !!! extra alcohol kick perhaps? The sugar gives a last feed to the yeast, adds some fizz and balances out the heat of the Sato. Have you done several rounds of preparing this yet? Made adjustments for taste and/or consistent results? You know there’s a place in Sankampaeng that is claiming to be selling sato but it’s at least filtered if not many other things that would seem to distinguish it from what you are describing here. Last I checked they have three flavors: Manee (green tea infused), Choojai (Plain, I think and my favorite but it’s not always consistent), and another one that like those is names after a Thai children’s story character. Not sure if this stuff makes it south of Chiang Mai though. I just had some jar wine in a Krung village in Eastern Cambodia and I’ve had other varieties in other upland ethnic areas but mostly lao khao in Thailand, which I think is far inferior in taste to the undistilled varieties. I’ll be trying your method when I’m back in Chiang Mai! Hi Taylor, i did try different methods, until i ran out of the yeast balls. Using Red Yeast Rice (RYR) – which is easy to find in Chinese markets – added a fruity flavour to the standard sato. Also, using the Khao Mak yeast ball, i found the sato more drinkable (more sweet). With the real Sato yeast ball, there is a slight burning in the back of the throat, and more strong! I also found using jasmine rice or other plain rices also worked, but they broke down more, leading to a murkier brew, which sours more quickly. Korean’s add sweet potato into the rice mix. I also tried with some added barley once, but it didn’t seem to work – although malted barley may be worth a try, or even germinated rice…. its all experiment! There is a great website, http://www.homebrewtalk.com/showthread.php?t=361095 where lots of people have been experimenting, but i noticed that they were not clear on the 2 different types of yeast ball, or on using sticky rice (and cooking it properly! ), which breaks down less than normal rice. Experiment away! Interesting to know how you get on sourcing the yeast balls too. I found it difficult in the city, but once in the village, its everywhere, and isaan friends always seem to be able to find it 😉 There are some legalised sellers in Bangkok, but i had no luck trying to find them, just a lot of distrustful stares…..
Hi Taylor – Where can I buy the Yeast balls in Bangkok? I make sato near Sydney. My Isaan in-laws not only say its the same as home – but even say its “Saap” -(and they’re sparing with the compliments). Chinese style yeast balls are available in Cabramatta (the Vietnamese quarter of Sydney). To counter the lower alcohol yeast in these balls – I add a champagne yeast (available in brew shops- eg lalvin 1118, CL23) 1/2 way through the process. ( I think this would work with Khao Mak balls also and would allow them to ferment to sato high alcohol, but have not yet tried). 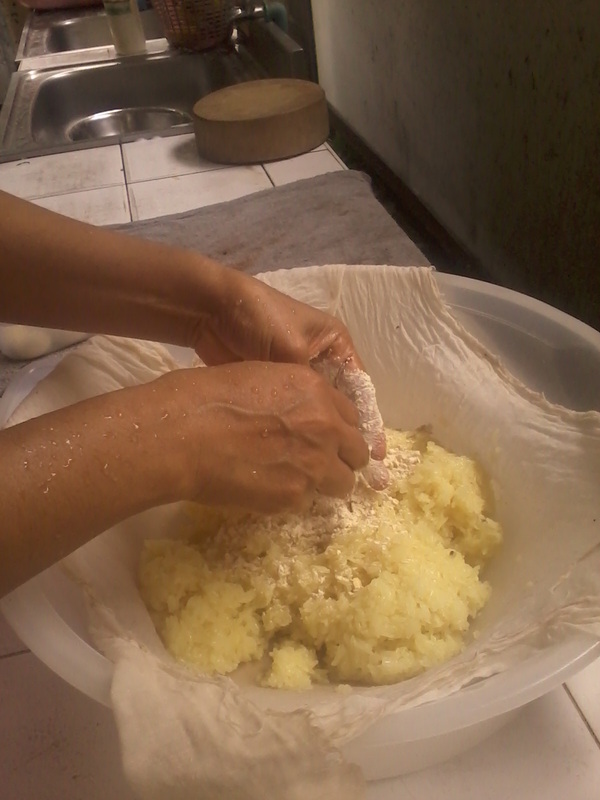 Recipe, – Soak (for 6 hours) and steam 2 kg (dry weight) sticky rice. Grind 2 yeast balls. Mix yeast with about a cup of water and massage through the cooled rice. There still should not be any wet layer at the bottom. Leave in a lidded bucket for 4 days ( 4 days in hot weather that is- sato is best made in summer in colder climates). Rice will now be sweet to the taste, and may now have some fluid at the bottom (released as the rice starts breaking down). Add 3 litres of water – with 1/2 a pack of champagne yeast mixed in. The rice cake will soon float to the surface. Leave for another 3-4 days . When the wine is still just a little too sweet – flip the rice cake on top over (trying to keep it in one piece as much as possible). [At about this stage you can add 2 litres of water and 320g sugar. This detracts from the final flavour a bit – but extends your sato. If your a purist/perfectionist you’d probably skip this step]. Once the sato dries out (meaning the sweetness goes) use a ladle pushed into the edge of the rice cake to get sato. Sato is traditionally drunk young, while it still has a tinge of sweetness and slight carbonation. Although they do bottled varieties in Thailand – these have never really caught on – as its just not the same as drinking it young out of the tub. Jackfruit – more than just fruit!